Okay, how about a vertical composition from EMP today? All the EMP are just BEAUTIFUL! I have SERIOUS Gehry envy! These are beyond amazing. Seattle is now on my agenda! Louise is right, be sure to pack your polarizer. Correct a Polarizer for this building is a MUST. You will see three different color combinations by rotating it..
super stuff JB! Think there is a spot on my wall for one of these!!! Another beautiful shot, John. And a very deft touch in composing so that those few turquoise elements are included in a way that makes the predominant tones all the warmer by contrast. And pleasantly vertiginous as well 🙂 Slainte, and a happy Summer Solstice to you and yours! Another great shot. The subtle turquoise against the gold and the flowing curves really catch my eye. I am looking forward to my opportunity at EMP. Any other tips ?? GehryEMPtastic! 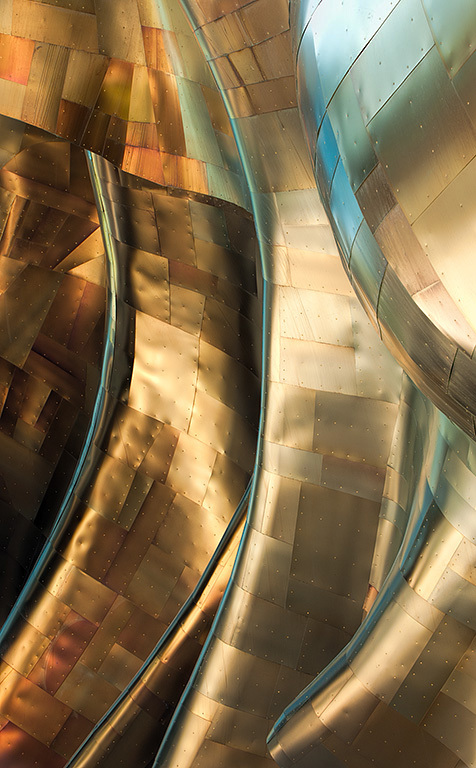 Amazing how every inch of Gehry’s work and creations is artistic within its own – piece by piece – and in its entirety! A genious and master of Awesomeness (you too JB!)! Yeah! I love the lines in this! Fabulous image John!